Jacopo Bassano was one of the most famous and influential masters of the late Renaissance in Italy, admired for his luminous color and sensitively observed incidents from everyday life. Trained by his father in the north Italian town of Bassano del Grappa, he worked in neighboring Venice in the early 1530s. His youthful works reflect the influence of Titian and other north Italian masters, along with artists ranging from Raphael to Dürer, whose compositions he knew through prints. Already by the late 1530s his powers of invention rivaled those of his contemporaries Tintoretto and Veronese. The Kimbell Supper at Emmaus depicts Christ’s miraculous appearance after the Resurrection (Luke 24:30–31). In the act of blessing and breaking bread at the inn, Christ reveals himself to two of his disciples, who failed to recognize him as they traveled on the road to Emmaus. Christ is seated beneath a splendid velvet green canopy that delimits the sacred space. The sacramental message is elucidated in the finely executed still life of bread, wine, and eggs––the latter a traditional symbol of resurrection and immortality. Distinguished by their contemporary dress, the well-fed innkeeper with a large purse and the plumed serving boy––along with their visual counterparts, a wary dog and menacing cat––attend to mundane affairs, unaware of the divine mystery unfolding before them. 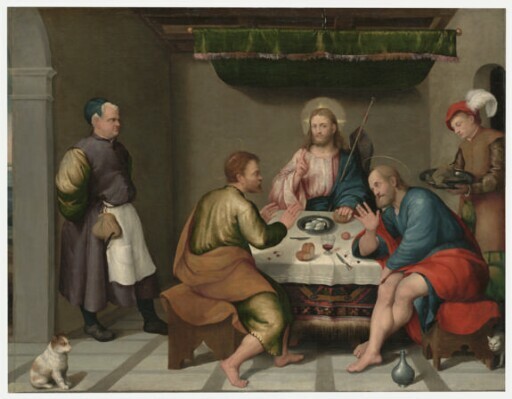 A significant alteration to the composition of The Supper at Emmaus was discovered in a recent cleaning of the painting. A landscape seen through an archway, as in the altarpiece in Cittadella, Italy had been cut from the left side, converting the image into an interior scene. It is estimated that approximately 3-1/4 inches (8.35 cm) were removed. The landscape had not only provided the source of light, but it also made the composition asymmetrical. Fortunately, a small strip of the original landscape could be recovered in the recent restoration because it had been folded over and used as a tacking margin. Five cherries that had been over-painted were also uncovered during cleaning. They were abraded, but one could clearly make out their presence. The number of cherries--a symbol of Christ's martyrdom--is significant iconographically. As in another painting by Bassano in the Kimbell's collection, Portrait of a Franciscan Friar, the artist used white lead in the ground layer. The priming was similarly applied in broad vertical and horizontal strokes with a spatula, which can be seen in the x-radiograph. Commissioned by Cosimo da Mosto for the Malipiero family, Cittadella, Italy, 1538. William Graham [1817-1885], London, by 1882.
purchased by (George Donaldson, London), for £22.11.6. purchased for 80 guineas by( Collings) . Probably purchased by (Paul Bottenwieser, Paris and/or Berlin), by 1938. (Arnold Seligmann, Rey & Co., New York), by 1940.
purchased through (Acquavella Galleries, Inc., New York) by Kimbell Art Foundation, Fort Worth, 1989.